New development in the field of modern car manufacturing require new or adapted nondestructive inspection methods. This concerns the car body itself as well as all the mounted components. To fulfil the requirements for the wide range of applications special techniques were developed, which includes the development of probes, methods and software. Due to the fact that not all inspection tasks can be solved by means of ultrasound, also hardness test methods and solutions with X-Rays are presented in this paper, where especially the radioscopic and the three dimensional Computer Tomography are pointed out [ 1 ]. An airbag gas generator is shown in figure 1. It contains several laser welds. Fig 1: Airbag Gas Generator. Fig 2: Partial Aspect with Laser Weld. The partial design of the object with weld is presented in figure 2. The task is to measure the depth of the weld and to detect defects, e.g. pores, in the welded zone. For this purpose it is recommended to apply the ultrasonic immersion technique in combination with the point focussed probe H10MP15 (f =10 MHz, focus depth = 15 mm in water). With a radial insonification and by means of an object rotation and probe shifting a C- Scan-Image (Helical Scan) is obtained, as presented in figure 3. Here, the echo amplitude is plotted versus the rotation angle (0 to 360 degrees) and the probe shift (0 to 17 mm). The amplitude is colour coded: red represents a high amplitude of the backwall of the first plate or of defects in the weld and green presents a low amplitude or missing signal. 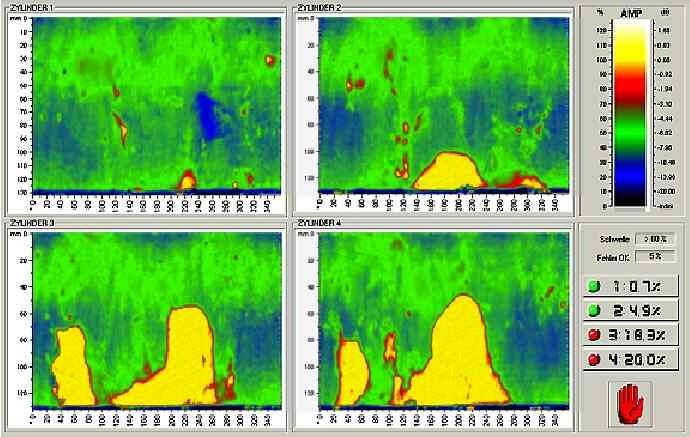 This allows the detection and localisation of defects as well as the evaluation and determination of the weld depth, as demonstrated in the magnified C-Scan part, figure 4. Fig 4: Magnified Part of the C-Scan. Software: UltraMap for motor control, data acquisition and generation of C-Scan images. The considered motorblock unit is made of cast aluminum and contains cylinder liners made of gray cast iron with a wall thickness of 4 mm. The inside diameter is 80 mm. The task is to inspect the bonding between the cast iron liner and the aluminium casting. As shown in Figure 5, the wall of the liner is scanned by vertical beaming using the immersion probe H5K and a 450 deflection mirror. The quality of bonding can be read from the amplitude of the backwall echo: A small echo describes a good bonding and a high signal the bad bonding accordingly. Fig 5: Al-Motor Block with Cast Iron Liner. In order to generate a C-scan, the total liner surface area is helically scanned from inside. To achieve this, the probe is shifted vertically, and the deflection mirror is rotated around its axis. Figure 6 shows a motor unit and the probe holder with the deflection mirror. This system permits a helical scan of the entire liner surface area. Fig 6: The Motor Block and the ultrasonic probe with deflection mirror. Fig 7: C-Scan-Plots of 4 Cylinders. Figure 7 presents typical C-scans as a result of the bonding test. The high amplitudes (bright) to be seen there describe the areas of bad bonding, i.e. the lack of fusion. A typical defect of castings are core mismatches. The consequence of such defects in camshafts are failures because of extreme dynamic loads due to reduced wall thicknesses. 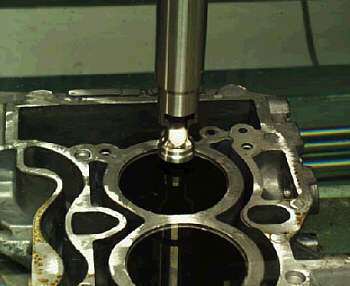 Fig 8: Ultrasonic measurement of thicknesses on a camshaft. The recommended solution is to measure the wall thickness on the bearing points. The simple, annular geometry of these points allows to carry out the test on the shaft as cast. Further processing actions on any defective parts can thus be excluded. Fig 9: Lineplots of circumferential thickness measurement. This method makes it possible to recognise the core mismatch by a reduced wall thickness and excessive wall thickness on the opposite side (180°). The waterflow technique using a so-called squirter or bubbler probe is applied according to the arrangement shown in the sketch, figure 8. This ensures a constant coupling in the area of the bearings around the entire circumference during camshaft rotation. Figure 9 presents two lineplots (Thickness versus rotation angle). The upper plot represents a uniform wall thickness with Dd> < 0.6 mm and the lower plot shows a varying thickness with Dd> 2.5 mm. In order to attain adequate service lives, that means high capacity of resistance to wear, camshaft running faces are hardened, for example in the laser beam remelting process. 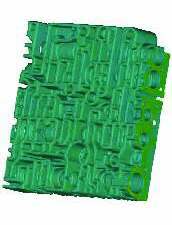 It must be ensured in this process that the martensitic microstructure is developed uniformly over the camshaft contour by exact thermal processes and time sequences. This process is checked by means of hardness testing. This calls for a method that keeps the necessary time expenditure within certain limits even with statistically required multiple measurements. For this purpose we recommend the hardness test according to the UCI method (Ultrasonic Contact Impedance). where F is the indenting Force and A the indentation area. In case of the UCI method the Vickers diamond is mounted on a vibrating rod, which changes the vibration frequency during the indentation process. The frequency change is proportional to the indentation area. This allows a fast and mobile test procedure because the microscopic area measurement is no longer necessary. Using the test load of 0.3 kgf (3 N) and 1 kgf (10 N) respectively, an approximative nondestructive surface hardness determination is achieved (experience shows that the indentation depths of Vickers diamonds are at around 4 to 7 ľm). 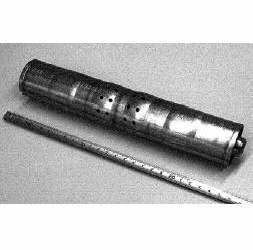 The measuring process is considerably simplified by the special test support MIC 225 for hardness testing on camshafts. This is achieved by mounting the camshaft in vee-blocks and an air bearing slide carriage with probe support guiding the measuring device parallel to the shaft axis. The torsion of the shaft during the measuring process is prevented by a magnetic locking, which ensures an exact positioning of the probe on the camshaft base circle or camshaft tip. 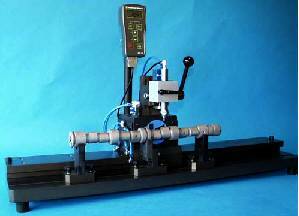 Fig 10: Camshaft Hardness Testing setup. Besides the UCI-technique further methods for the mobile hardness testing are available: The rebound method and the TIV-method (Through Indenter Vision). The selection of the right method depends on the type of inspection task. In figure 11 a valve is presented. Smaller types are used in the motors of cars, larger ones in diesel engines of ships or locomotives. The diameter of the transducer is matched to the shafts diameter. The acoustically absorbent protection layer (coupling membrane) reduces coupling deviations caused by standard hard-faced probes. Indications from the weld zone are evaluated which extend above the noise level caused by coarse grain structure formation. Fig 12: Inspection of friction weld in the shaft. The complete weld area is covered by guiding the sound beam into the valve shafts. It is recommended that the test method be used due to its easy application and its clear indications in engine production and for input checks. The cladding on the valves produced by overlay welding has to be tested for bonding flaws and inclusions. For this purpose mostly the immersion technique is used, according to figure 14. A valve rotation allows the inspection over the whole circumferential range. In case of smaller valves one track is enough. 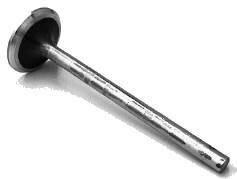 For larger valves it is recommended to shift the probe and to scan several tracks. Fig 14: Setup for the cladding test. Fig 16: Manual Inspection with direct coupling. The interpretation of the A-Scans (figure 15) is easy: The flaw free situation is presented on the left side. The A-Scan contains only the Backwall echo (BE). A lack of fusion or an inclusion is indicated by a flaw echo (FE). In case of large Diesel valves, or if only smaller numbers of valves have to be inspected, it is also possible carry out a manual inspection using the probe SEB10KF3 in direct contact mode, see figure 16. For the inspection of aluminium or magnesium castings, e.g. wheels, steering housings etc., the X-Ray technique is commonly applied, where the radioscopic method reveals a real time procedure. The basic setup is shown in figure 17. The specimen is positioned on a manipulator system between the X-Ray tube and the imaging device  an Image Intensifier or a flat panel detector. The relation between the distances FDD (Focus Detector Distance) and FOD (Focus Object Distance) define the geometric enlargement of the displayed object details. The digital image signal is displayed directly on a monitor or can be processed, in order to detect automatically (computer aided) the indications of flaws. Figure 18 presents a view inside a radiation protection cabinet, where a steering housing is mounted on the manipulator. In the upper left corner a radiographic image is included. The available contrast of the radioscopy permits the detection of flaws with minimum extensions of approximately 1% of the actually penetrated wall thickness. The lateral resolution depends of the focal spot size, the geometrical magnification factor and the resolution of the imaging device. Fig 18: View inside a radiation cabinet and a radioscopic image of a steering housing. The x-ray transmission techniques radiography and radioscopy deliver shadow images, without any information about the depth of a flaw or any geometrical indication. The complete information however can be obtained using tomographic methods. 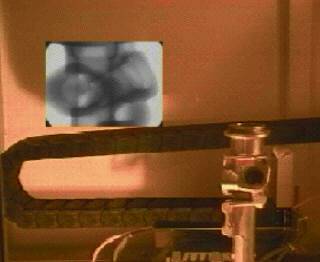 Here, the test sample is rotated in the x-ray beam, see figure 19, and by means of a computer reconstruction the intersections of the object or even three dimensional images are obtained. Fig 19: Setup for the Computer Tomography. The high sophisticated computer tomography allows the detection and localization of flaws like gas pores or shrinkage cavities and the determination of geometrical properties like internal wall thicknesses and core mismatches. The 3D-CT is used for example for the inspection of motorblocks or hydraulic labyrinth systems or pump housings, as shown in the figures 20 and 21. Fig 20: 3D-Tomogram of a hydraulic labyrinth block. 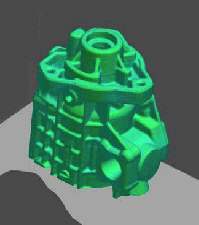 Fig 21: 3D-Tomogram of a pump housing.